When Lettie Teague moved to wine country last fall, she realized that she'd better make friends fast to beat the winter blues. Could meetup.com be the answer? I have visited wine regions all over the world but never lived in wine country before I moved from the New York City suburbs to the North Fork of Long Island last October. I wanted to see what it was like to be surrounded by vineyards year-round instead of just visiting them for a few days at a time. While I figured the transition to rural life would have its challenges, I didn't think one of them would be finding like-minded friends. After all, there are dozens of wineries within 10 miles of my new house. Then my friend Louisa, a longtime North Forker, issued a warning. "November and March are the hardest months," she told me. People who live on the North Fork either hibernate inside their houses or flee to sunnier places, she explained. I understood the threat of Novemberthe waning of daylight, the onset of cold weather. But why was March, with its promise of spring, a month to be dreaded? "Spring doesn't come until very late out here," Louisa replied. "In March, it feels as though winter will just never end." Clearly, I needed to make some more friends fast. But how? I shared my dilemma with my friend Michael, an artist who lives in Connecticut. Had I ever tried a Meetup? he asked. I wasn't looking for a date, I said. A Meetup, he replied, wasn't about dating but about bringing people with shared interests together. Didn't I remember how important Meetups were in recent elections? They were a powerful political tool. In fact, much of Howard Dean's early success in the 2004 Democratic primaries was attributed to the way his supporters rallied for him via Meetups. Michael had attended quite a few Meetups; most had been art-related, though he'd attended a dating one, too. That had been a bit of a bust. "The whole point of a Meetup is to meet people with whom you have something in common," Michael explained. "But all I had in common with those people was the fact that I needed a date." According to the company's website, meetup.com was created to "revitalize local community and help people around the world self-organize." It claims almost six million members in over 11,000 cities, who are willing to "self-organize" around such diverse topics as knitting, Barbie collecting, politicsand wine. It was easy enough to search the meetup.com database: I simply typed in the word "wine" and my zip code. I was immediately directed to a home-brewing group in Old Saybrook, Connecticut. (Old Saybrook is 20 miles from the North Fork as the crow flies, but the Long Island Sounda great body of waterlies in between.) I don't drink beer and have even less interest in brewing my own. But no matter how I tried to search"wine tastings," "wine dinners," "wine pairing"I still turned up beer. 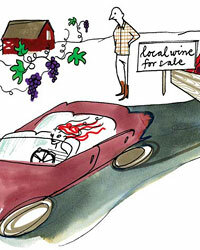 How could there be no wine Meetups in wine country? Would I have to "self-organize" one? That turned out to be remarkably simple. Five minutes and $22 later (for a three-month membership), I became the founder of East End Wine Lovers. (East End is the collective name for the North and South Forks of Long Islandthe latter is better known as the Hamptons.) I uploaded a photo of a vineyard, pledged to create "a real face-to-face community" and waited for someone to join. In just a few hours, several members signed up. "I like wine," one wrote, which seemed a promising start. This was so much faster and more direct than trying to meet potential new friends in the real world. Why didn't everyone "self-organize"? And then there was silence. For a day. Then two. Not a single new member joined my group. I e-mailed Meetup community specialist Joshua Reid and asked him what to do. (This was a bit embarrassing, like admitting no one wanted to be my friend.) Joshua e-mailed back a generic pep talk, reassuring me that people would join and that I needed to "give it time," just like in real life. I decided to try real life instead. The next day, I met my friend Jane for lunch at Love Lane Kitchen in Mattituck. I told Jane about East End Wine Lovers and she immediately wanted to join. When Love Lane's manager, Carolyn Iannone, stopped by our table, I told her about it too. "I love that!" she said. Carolyn is an energetic and enthusiastic 25-year-old, and everything she says is delivered with an exclamation point! "I want to join! And I know lots of other people who would join, too!" By the end of that day, East End Wine Lovers had 20 members, and by the next day, 32thanks in no small part to Carolyn, who put the word out to her family, friends and a few local winemakers. Was it alright to have an online group that grew by word of mouth? I made a note to ask Joshuawho, in the meantime, had e-mailed that it was time to plan an actual in-person gathering. But where to meet? I didn't want to have everyone at my house. "What about Love Lane Kitchen?" Carolyn said. 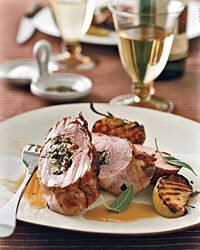 That sounded great; I would ask everyone to bring a favorite wine, and Love Lane could put together some appetizers. Carolyn adored the idea, as did owner Michael Avella. It certainly was effortless so far. But I thought I should check out a few other wine Meetups, to make sure I ran mine correctly. I found several in Manhattanfor Israeli wine drinkers, Champagne lovers, pricey-wine fans. I chose two groups with gatherings on the same night: the Greek Wine Society (186 members) and SuperNodes, for "Wine & Networking" (42 members). Michael agreed to come with me to the Greek wine Meetup, but I'd have to go to SuperNodes alone. The SuperNodes Meetup took place at a wine bar in the Meatpacking District. The first SuperNode I encountered was Vincent, nursing a ginger ale. "I'm not much of a wine drinker; I'm more of a networker," he explained. I ordered a glass of 2008 Gobelsburger Grüner Veltliner and made my way to the back of the room, where I bumped into SuperNodes Doug and Tutu, both IT pros. What was a SuperNode, anyway? "You really need to meet our organizer, Theda," said Tutu, who was holding a glass that he thought "might be Shiraz." Tutu was a wine novice. "She's the one who's into wine," he said. Alas, it didn't look like Theda was going to show up, and by now I was late to meet Michael. Michael was waiting outside the Greek restaurant Kellari when I arrived. "They don't know anything about a Meetup," he said. "What do you mean? This is the place that was on the website," I replied. Michael shook his head. "The manager had no idea what I was talking about." Indeed, the manager simply shrugged when I asked about it. "Now you know the downfall of Meetups," Michael said. "I once went to one that was supposed to take place at a bar, but when I got there, the bar didn't even exist." Why, I wondered, was Michael just now telling me about this? Since neither city Meetup had gone well, I decided to attend another, this one in the suburbs. Members were asked to bring a Bordeaux that cost less than $20, a limitation that can be challenging, as cheap Bordeaux tends to be thin and astringent. But I bought my bottle and drove in. This Meetup took place in a church social hall that looked like a grade-school auditoriumalbeit one adorned with plastic wine grapes. The turnout was good, with about 40 people, both men and women. I handed over my bottle to a man who promptly covered it with brown paper. "We're tasting blind tonight," he said. There were various vintages from a wide variety of regions: Saint-Émilion, Margaux, Haut-Médoc, Côtes de Blaye. What was the point of blind-tasting them all? "So there will be no preconceived notions," the man with the paper answered mysteriously. I didn't tell him I had plenty of preconceptions about cheap Bordeaux. Everyone stood in rows around a table, unsure what they were supposed to do. "Be your own guide to Bordeaux," the organizer, a short, jolly man, exhorted us. I guided myself through about 20 wines, which were uniformly harsh, before I gave up. 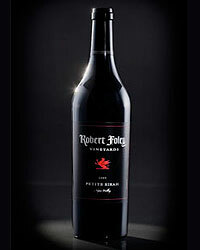 But just before I departed, I found a man off in a corner drinking from a bottle of Forest Glen Winery California Merlot. "This wine is really good," he said. The day before my Meetup at Love Lane Kitchen, Theda called. "That was the first SuperNodes gathering I've missed in three years," she said. I told her I was about to hold my own inaugural Meetup. "Do a webcastmaybe a podcast," she counseled. "Make it a date-night Meetup. That will improve your numbers." But I'd already billed it as a BYOB evening. 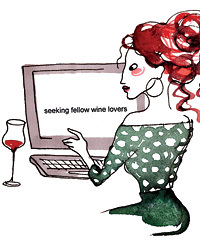 "Then make it more about networking than wine," Theda replied. "And take a lot of pictures, but only of attractive people," she added before she hung up. The next night, I arrived at Love Lane convinced my Meetup would fail. Carolyn, her sister and her sister's boyfriend were at the bar, overlooking a table laid out with what looked like the entire menu: cheese, sushi, oysters, crab cakes, short ribs. 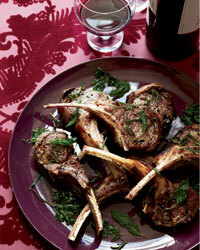 There were even lamb chops. "At least if no one shows up, we'll have plenty to eat," said Carolyn cheerfully. I felt a clutch of fear. Time passed. Two minutes, 10, or was it an eternity? The door didn't open. Why hadn't I billed my Meetup as a date night? Why hadn't I made a podcast? Was anyone who wasn't related to Carolyn going to show up? Just then, half a dozen people walked in, some carrying several bottles of wine. I introduced myself while Carolyn checked names off her list. The room grew crowded with people, the bar crowded with bottles. There was a mix of Long Island wines, as well as choices from Chile, Argentina, California and Spain. Carolyn's mom brought a Bordeaux. "I love Château Gloria because it's my middle name," she said. I was heartened by how many local winemakers were therefrom Pindar, Lieb Family, Paumanok, Waters Crest, Jamesport. Wölffer Estate's Roman Roth "couldn't figure out how to RSVP" online, so he simply showed up. It felt like a party, but at the same time, people tasted the wines with care. John Levenberg, a local winemaking consultant, pointed out the bottles that impressed him the most, including what turned out to be the crowd favorite, the 2007 Jamesport Vineyards Petit Verdot. "I can't believe no one's ever done this before," remarked Barbara Smithen, the proprietor of Sherwood House, who'd brought a very nice Merlot. "You have to do it again soon." In fact, several members had ideas for future Meetups: single varietals, Long Island wines and, yes, blind tastings, too. Despite the success of my first Meetup, I realize there is no such thing as an instant community, and that it takes time to develop lasting bonds. But a shared interest in good wine is certainly a starting point, and I hope to make East End Wine Lovers gatherings a regular Meetup event. I don't know if I'll employ any of Theda's suggestions (especially the podcast), but I do hope that in a year's timeand in five or 10the people I've met through my Meetup will still be my friends. Can Long Island Make World-Class Wines?